We are updating this post with a new movie illustrating the original Getaway model of London. 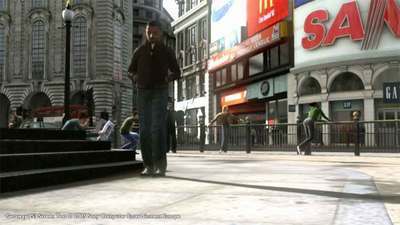 The movie, embedded further down the post, provides a walk through of various London locations. Of note is the basic modelling to cut down polygon counts and the low resolution textures due to hardware limitations. Despite this the model still stands head and shoulders above almost any architects model of the city today. London has been featured in many games over the years and in increasing levels of detail as game consoles and budgets increase. In the first of a more detailed look into the production of 3D cities for games we turn our eye to the forthcoming PlayStation 3 and The Getaway. The Getaway originally appeared on the PlayStation 2 recreating a 3D rendition of London covering approximately 10 square miles (16 square kilometers ). The team produced a wire frame model based on a photographic survey of London and then projected the resulting textures onto the geometry. The game is viewed from the street level allowing some simplification of buildings. In a write up for the BBC Senior producer Peter Edward mentions that “The street sites are like a western movie. They don’t have wooden slates at the back but they are just the fronts”. This is the easiest (if easy is the word) way to rapidly create geometry by ignoring the overall building footprint and pasting on rectified images to create facades. The use of High Dynamic Lighting, real time traffic, pedestrian simulations, and detailed geometry is impressive. The game looks like it will represent the state of the art in city modelling. It continues to amaze me that some of the best simulation and computer graphics technologies are developed for games. I guess I’ll have to wait for the game to find out what game plot required such realistic renderings – or, maybe this is just an outlet for some urban simulation researcher who found good R&D money at a game company? Games demand big budgets as they are showcases for the international companies such as Microsoft and Sony. Gamers are used to a high level of graphic technology so any game that requires city based visualisation concentrates on the best rendition possible. The 2nd video has been taken down from YouTube. Microsoft Flight Simulator is another good example of where a lot of money has been spent trying to get realistic looking cities, although it seems The Getaway has taken it to another level. I am a 3D modeller, and so appreciate how long and how much effort modelling London must take..
if you guys really into a realistic games?? please feel free to visit my blog.. dont forget to leave a message and put your link so that others can view you..thanks..